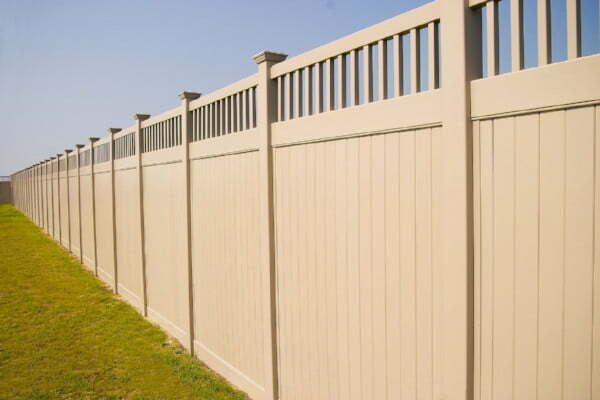 One common question we get about our vinyl fence products is whether vinyl fence and PVC fence are the same thing. The simple answer? Yes, vinyl and PVC fences are the same – but they also aren’t. Keep reading to understand what the differences are and what sets our vinyl fence products apart. If you’ve ever done any home improvement projects, you’re probably familiar with polyvinyl chloride, or PVC. PVC is a common formulation of vinyl that is used in a huge number of ways, including plumbing, construction, electrical insulation and more. PVC has many benefits including a high strength-to-weight ratio, low production costs and a long lifespan. Vinyl fences use PVC as a main ingredient, though some also combine it with other formulations of vinyl including polyvinyl acetate (the main component of wood glue) and polyacrylonitrile (a common acrylic fiber). This has led many in the fencing industry to use the terms “vinyl” and “PVC” interchangeably. However, calling a vinyl fence a “PVC fence” isn’t accurate, because vinyl fences contain much more than just PVC. At Future Outdoors, we fabricate our vinyl with a combination of special materials that all work together to create a durable, long-lasting fence. Are All PVC Fences the Same? Since vinyl fences are all made from the same basic chemical, you might think that they’re all basically the same product. This couldn’t be further from the truth. The reality is that vinyl fences vary widely in terms of quality, even more than wood fences do. If you want a quality vinyl fence, you need to make sure you’re buying from a company you can trust. Unfortunately, many “big box” retailers and home improvement stores have given vinyl fences a bad name. These companies sell cheap, DIY vinyl fence posts and panels that don’t stand the test of time. They are made using simple or low-cost vinyl formulations and tend to be very brittle and easy to damage. UV Inhibitors to prevent fading, chalking, and other damage from solar radiation. Impact modifiers to make the vinyl more durable and resistant to damage. Stabilizers to keep the vinyl’s composition even and help it resist changes in temperature. High-quality dyes and colorants to create rich, vibrant colors that match or accent your home. Other vinyl fence manufacturers use different combinations of these ingredients or don’t use them at all, resulting in a lower-quality product that doesn’t last as long or perform as well. Want to learn more about our vinyl fence products and how they can improve your home? Call Future Outdoors today at (972) 576-1600. As the number one provider of vinyl fences, vinyl decks, and vinyl shade structures in the Dallas metro, we can offer you the best deals and the most experience for your vinyl fence installation. You can also visit us on Facebook to see pictures and read reviews from past customers.